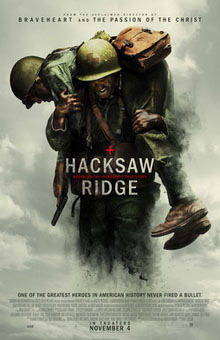 I watched an (anti-) war movie (Hacksaw Ridge), a true story account of a conscientious objector in the American army in WWII. It is an impressive movie by Mel Gibson about an American pacifist combat medic who, as a Seventh-day Adventist Christian, refused to carry or use a weapon or firearm of any kind; he became the first conscientious objector to be awarded the Medal of Honor, for service above and beyond the call of duty during the Battle of Okinawa (Wikipedia). I am the father of an Australian soldier. My son Radjin served for four years, visiting places like New Guinea and Timor Leste … but refusing to go to Afghanistan, with - at the time - its hot war, so as to not having to shoot his gun at enemy soldiers. I was a conscientious objector myself in my days, refusing to go to do military service. At the time, in the 1960s in Germany, conscientious objectors were given a choice of doing civil service instead; they would go to work in hospitals, old peoples’ homes etc. I was not accepted and had to go to court, where I was told I would have to join up … I still refused, was dragged into court again, with the process repeating itself for a third time. In the end, after a few years of this charade, I left Germany and the issue was never raised again. This blog, however, is not about conscientious objection, it is about another aspect of the movie: Faith. Myself, I am not a ‘person of faith’, I do not follow a religion and I have - for many years now - been interested in the issue of faith and how people deal with their experience of, or commitment to their faith. What makes a person of faith tick? Indeed, what does it mean to have faith … in God and/or Jesus Christ? I don’t know, but in this movie the main character displays an incredible rendition of his faith and its application. This is the story: Desmond Doss, when in training is despised and bullied by his fellow soldiers, who cannot come at the idea that someone wants to sign up, yet not carry or use a gun; they mistake him for a weakling and a coward. The movie stages the most horrific battle scenes ever seen (comparable to the ones in Saving Private Ryan). But in the end it turns out that Doss is among the most brave and strong soldiers. One aspect of his bravery I find telling ... and here is the twist (well, at least as I see it) in Hacksaw Ridge: Doss prays and asks his God to talk to him, to give him a sign of sorts (even though Doss had insisted to a US army physician that he was not mad, did not hear "voices from God" and had no intention of accepting a psychiatric discharge). This predicament that he finds himself in was addressed before in the movie Silence (in which the actor Andrew Garfield stars too): When anybody asks God to respond and give a sign - any sign - to encourage the devout believer, they are met with … Silence. So Doss asks his God to speak to him. He then listens intensely. But all he can hear is the moaning of an injured soldier. He then goes and rescues that soldier. Next he says to God, “please, one more” and again he hears (the voice of God?) a soldier in pain asking for help. This is repeated over and over … I guess one must see the movie to experience the impact of these occurrences, these scenes are truly harrowing (though the movie in the end becomes somewhat sentimental). The fourth type of God I can believe in: It is the seat in us of compassion, goodness & integrity - a belief that guides & comforts us and gives us strength. I added the attribute of ‘strength’ after seeing the movie Hacksaw Ridge - because this is the outstanding attribute of the young soldier’s faith: It did give him strength … above-human strength. And he truly heard the voice of God. But therein does lie a problem: Some people may hear the voice of God compelling them to do good; others may hear a voice - which they deem to be God's - to do evil (murderous religious fundamentalists). In which case God had turned into the devil.